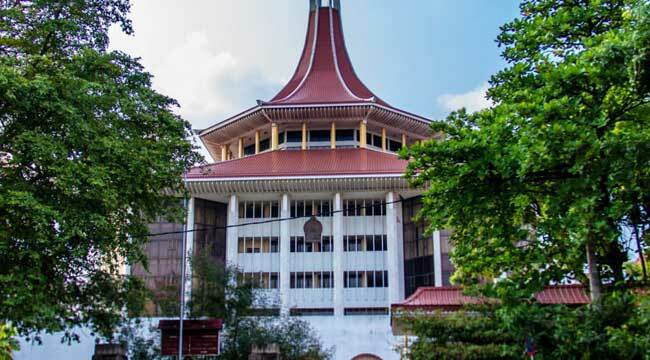 Colombo, December 6 (newsin.asia): With all political efforts to clear the month-long political and constitutional logjam having failed, Sri Lankans are waiting with bated breath to hear the Supreme Court’s rulings on the divisive issues involved. The destiny of the 21 million citizens of Sri Lankan is now in the hands of seven judges of the apex court. Their ruling, expected any time after December 6, will determine whether Sri Lanka will have a stable government or it will slide into anarchy. Meetings between President Maithripala Sirisena and the opposition United National Front (UNF) have consistently ended in deadlock. A Court of Appeal stay on the functioning of Mahinda Rajapaksa and 49 others as Prime Minister and ministers respectively, has crippled the government. The Lankan government is now being run by the Executive President Sirisena and the Secretaries of the various ministries. There is neither a Prime Minister nor a council of ministers. All issues dividing the Executive President and the opposition comprising the United National Front (UNF) and its allies, are now before the Supreme Court . The first political failure was the inability of President Sirisena to get along with his Prime Minister, Ranil Wickremesinghe, from the day they took office as coalition partners in January 2015. The two differed on policies. The President was Left of Center and a nationalist while the Prime Minister was a neo-liberal internationalist. But the differences were not ironed out by discussion. Wickremesinghe would take decisions without consulting the directly -lected Executive President, Sirisena, and President Sirisena would in turn use his executive powers to countermand Wickremesinghe’s decisions. This conflict had brought all development work to a standstill, which in turn led to their dismal performance in the February 10, 2018 local bodies’ elections. The opposition Sri Lanka Podujana Peramuna (SLPP) led by Mahinda Rajapaksa swept the polls. The second failure was in the manner in which President Sirisena tried to get rid of Wickremesinghe. Sirisena’s efforts to persuade the UNF to put up a more amiable and politically agreeable person for appointment as Prime Minister, failed. He had asked for parliament Speaker Karu Jayasuriya or Deputy Leader Sajith Premadasa, but both spurned the offer. The President then took the precipitate step of summarily and unceremoniously sacking Wickremesinghe and appointing Mahinda Rajapaksa of the SLPP as Prime Minister. This was when Wickremesinghe had majority support in parliament (subsequently shown to be 122 out of the 225 members of parliament). The UNF, on its part, insisted that nobody other than Wickremesinghe would be its candidate for the Premiership. The UNF’s demand also meant that it disapproved the President’s act of dissolving parliament on November 9 and ordering fresh elections in January 7 ,2019. The UNF led alliance went to the Supreme Court to get the dissolution annulled. The court stayed the dissolution till December 7. The UNF went to the Court of Appeal challenging the right of Mahinda Rajapaksa and his 49 member council of ministers to function as Prime Minister and ministers respectively after they had lost a vote on a no confidence motion twice (on November 14 and 16). The Appeal Court stayed their functioning till December 12. But the Rajapaksa group went on appeal against this to the Supreme Court saying that the Court of Appeal could not hear a case relating to the constitution which is the exclusive preserve of the Supreme Court. Since the Supreme Court has two cases before it, and since its bench had been expanded from three to seven, a ruling is not expected on December 7 but a few days later. Wickremesinghe has not resigned his office. He has not ceased to be a Member of Parliament. He has not lost a vote on an Appropriation Bill or on a Statement of Government Policy or on a No Confidence Motion. And therefore, he ought to stay. It is also stressed that after the 19 th. Amendment of the constitution, the President has no power to sack a Prime Minister as per his will and pleasure. The UNF also argues that the President’s bid to point out a discrepancy between the English and Sinhala texts to justify the sacking of Wickremesinghe is not grounded on a correct reading of the Sinhala text of Art 48 (1). The words “removal from office” in the Sinhala text about the exit of a Prime Minister, refers to the circumstance of removal from office according to the Constitution. It does not mean that the President can remove a Prime Minister arbitrarily. Under the constitution, the power of removing the Premier is vested solely in parliament which could do so only by rejecting the Statement of Government Policy or the Appropriation Bill or by passing a vote of No-Confidence in the Government. The President, by proclamation of November 9, dissolved parliament. On November 13 ,2018, the Supreme Court in response to several petitions, issued interim orders suspending the effect of the Proclamation until December 7. According to the UNF , the dissolution was unconstitutional and in violation of Article 70(1), which says that the President may by Proclamation, summon, prorogue and dissolve Parliament , provided that the President shall not dissolve Parliament until the expiration of a period of not less than four years and six months from the date appointed for its first meeting, unless Parliament requests the President to do so by a resolution passed by not less than two-thirds of the whole number of Members (including those not present), voting in its favor. It is pointed out that parliament has not competed four and a half years and has not made a request for its dissolution. Indeed ,the President is the sole authority under the Constitution with power to ‘summon, prorogue and dissolve Parliament’ (Art 33(2). But this power is not absolute. It must be exercised in accordance with Art 70(1) as amended by the 19 th. Amendment of the Constitution in 2015. However, in the Attorney General’s view, the President has the right to dissolve parliament, untrammeled by Art 70 (1). According to him, if the 19 th.Amendment had really taken away the President’s power to dissolve parliament on his own accord, the Supreme Court in its determination on the 19 th.Amendment would have said that it was violative of the basic structure of the constitution and called for a two thirds majority in parliament and a referendum to pass it. The President’s power to dissolve parliament was inherent to the constitution. Sri Lanka has a Presidential and not a parliamentary form of government. The Supreme Court’s determination had kept the Presidential power to dissolve, intact. “‘The 19th Amendment did not require a referendum because executive power was intact as it stood before the referendum. Executive powers cannot be eroded,” the Attorney General said. Lawyer Canishka Witharana, quotes A.V. Dicey, a British constitutional theorist, as saying that the Crown has the right to dissolve parliament in extreme circumstances. “A dissolution is in its essence an appeal from the legal to the political sovereign (the people). A dissolution is allowable, or necessary, whenever the wishes of the legislature are, or may fairly be presumed to be, different from the wishes of the nation,” Dicey wrote. According to Dicey the objective of dissolution is to “ascertain that the will of parliament coincides with the will of the nation”. The President may, subject to the provisions of Article 85, submit to the People by Referendum, any matter which in the opinion of the President is of national importance, Witharana points out. Or he could order a fresh election to parliament. The problem will be solved if the Supreme Court sanctions the decision to dissolve parliament and go for fresh elections. But if it says that dissolution was unconstitutional, then the political deadlock might continue. Sri Lanka might continue to be in turmoil and the State would be further crippled, unless all the political stakeholders put their heads together and come up with a workable solution. .